Triggers are an integral part of anything but the most basic of User Missions. This article cover the basic operation of triggers and what each available component does. Triggers are a feature of the Mission Editor which allow for vastly more complicated missions to be be created, they can used for scripted events, as well as for enabling more advanced mission features such as capture points, spawn points, visible way-points, and much more. As well as being useful for making more advanced single player missions an understanding of triggers is a necessity for creating multi-player user missions, as such missions require triggers in order to function. Triggers consist of three main components (also known as elements): Events, Conditions, and Actions. An event is what causes the trigger to executed, for example the "periodicEvent" event will execute the trigger once every user defined period of time (for example once a second, or once every 15 seconds). Once a trigger is executed a condition determines whether the trigger should continue on to carry out the actions assigned to it, or should not do anything / carry out any else actions assigned to it; for example the "UnitInArea" condition will carry out the triggers actions if the specified unit is within the specified area at the moment the trigger is executed. Finally actions define what the trigger actually does once it is executed and the condition is met; for example "playHint" displays a message on the user's screen and "unitDamage" can be used to damage part of, or completely destroy a unit. Actions can also can also be assigned as "elseActions" which instead of being carried out when the condition is met, will be carried out when the trigger is executed, but the condition is not met. If there are no elseActions then the trigger will do nothing when the condition is not met. 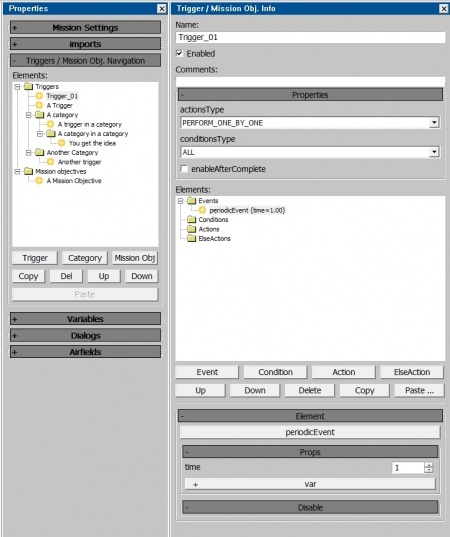 Triggers can be assigned multiple event, conditions and actions. If a trigger is created with no conditions then it will carry out its actions whenever it is executed, this is useful for triggers which always need to run, for example a trigger to draw various lines on the mini-map at the start of the mission. Be aware that if a trigger is created without conditions and "enableAfterComplete" is ticked then the trigger will run for ever, repeatedly every time tis event occurs (for a default trigger this means it would carry out its actions once a second, every second for the entirety of the mission, unless it is disabled by another trigger). In order to make a trigger you first need to display the trigger window in the mission editor, this can be done by clicking the "Properties and Triggers / Mission Obj. info" button (looks like ) on the mission editor bar at the top of the editor. This will open the "Triggers / Mission Obj. Info" window (from here on known as the "trigger window") at the right hand edge of your screen, this window is where you can edit triggers and mission objectives (for the time being it will be blank). Now in the properties window (where your mission settings are) scroll down until you reach the Triggers / Mission Ob. Navigation section and expand it if necessary. Trigger This button will create a new trigger, either inside the root "Triggers" folder inside the currently selected category. Category This button will create a new category, either inside the root "Triggers" folder inside the currently selected category. Categories are essentially folders for triggers, functionally they serve no purpose to the mission and exist in order to allow you to organise your triggers. Categories can be created inside other categories and form folder trees which can be collapsed in order to hide triggers not currently of interest (collapsing categories will not disable or remove their contents). If a category is disabled all of its contents (including stuff in sub-categories) will be disabled. Mission Obj This button will create a mission objective in the "Mission Objectives" folder. Mission objectives are described in other guides. Copy and Paste The Copy button will copy the selected trigger of mission objective. If a mission objective is selected and the copy button is pressed then a duplicate mission objective will be created. If a trigger is selected when the copy button is pressed then the Paste button will become available this allows you to select a different category for the trigger to be pasted into, once the destination is selected pressing the Paste button will create a duplicate of the copied trigger there. Del This button will delete the selected trigger or mission objective. Up and Down These buttons will move the selected trigger, category or mission objective up or down in the list, this has no effect on the operation of the mission and is used in order to keep the lists organised. In order to create your first trigger click the "Trigger" button, this will create your first trigger "Trigger_01" and display it in the trigger window. What you see will look similar to the image to the right (you will only have "Trigger_01" whereas the image has several other triggers, categories and objectives for demonstration purposes). At the top of the window is the triggers name, this can be changed to whatever you want (however should not the the same as any other triggers), it is best to pick a descriptive name such as "Setup" or "Teleport Player" to keep it clear what everything does, however this is completely optional. The next option is an "Enabled" check box by default all triggers start enabled, disabling a trigger effective stops it's event from functioning so it will never be executed; triggers can be enabled and disabled during the mission by other triggers. The next field is a comments box, this has no effect on the trigger's operation and is just for documenting what it does, it is completely optional. actionsType By default this is set to "PERFORM_ONE_BY_ONE" meaning the actions will be completed in the order they are present in the actions list of the trigger. This option can be changed to "PERFORM_ALL" where all actions are completed at the same time. conditionsType By default this is set to "ALL", but can be changed to "ANY". For triggers with multiple conditions this determines whether all of the conditions need to be met in order for the trigger to carry out its actions, or if any of the conditions being me is enough for the trigger to carry out it's action. enableAfterComplete By default this is set unchecked, meaning that once the trigger has carried out its actions it becomes disabled, if it is checked then the trigger will carry out its actions every time it is executed and the condition is met, instead of just the first time. Event, Condition, Action and ElseAction These buttons will display a new window with a list off all the available events, conditions and actions, depending on what button is pressed (the Action and elseAction buttons display the same list of actions, but will insert them into either the Actions or ElseActions area. There is a search box which will find the first item matching the phrase entered, it will only return the first entry in the list however, there may be more matches further down. To inset a component select it from the list and click "Ok". Up and Down These buttons will move the selected element up and down in the list. Changing the order of components only has an affect on the Actions and ElseActions area where the actions will be carried out in the order they appear in the list, if actionsType is set to "PERFORM_ONE_BY_ONE" (the default setting) in the trigger properties area. Delete This button will delete the selected trigger component. Copy' This will copy the selected trigger component, multiple components can be coped from different triggers (or the same one) without needing to press "Paste ..." each time. Paste ... This button will display a list of all the copied components (grouped by type) and allow you to select one to paste into the currently selected trigger. The "Element" section at the bottom will update with different fields and buttons depending on the currently selected trigger component. In this example we are going to make a simple trigger which will teleport the player to a new location when the player enters a specific area. For this example the player unit will be in a tank (placed as "tankModels" in the editor) called "Player", there will be an area called "Teleport_Area" and another called "Destination_Area" (exact setup can be seen in the image to the right). When the player tank enters "Teleport_Area" we want it to be teleported to "Destination_Area". To follow along with this example create a "tankModels" unit type, assign it as the player's vehicle, call it "Player" and set it to a tank you own. Create two box areas for the teleport and destination areas (called "Teleport_Area" and "Destination_Area"). If not already present from reading the previous section create a new trigger. You should now have a fresh trigger (likely called Trigger_01 or similar), we will begin by renaming the trigger to something more descriptive so if we come back to the mission later it is nice and clear what it does; to do this select the name field, delete the old name and type a new name for the trigger, for example "Teleport Player". We will leave leave most of the properties as default, however we will tick "enableAfterComplete" as we want the player to be teleported every time they enter the area, not just the first time. We will then select the "periodicEvent" event and set its time field in the Element area to 0.1, this means the trigger will be executed and check if the player is in the area every 0.1 seconds. 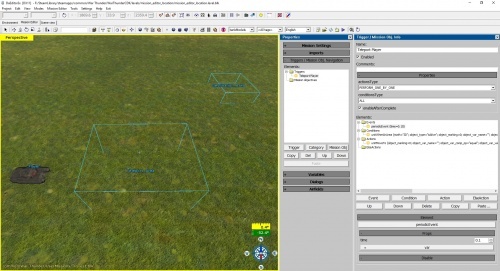 Math allows you to specify how the unit is checked to be in the area; by default it is set to "3D" so the unit must we within the area, if it is set to 2D then along as the unit is within the 2D footprint of the area it doesn't matter how high up the unit is (this setting is mainly useful for triggers aimed at aircraft). This field can also be set to "notNear2D" or "notNear3D", these work the same as "2D" and "3D", but will activate the trigger when the unit is not within the area, instead of when the unit is within the area. The "object_type" and "unit_type_ex" settings allow you to specify criteria about the unit, by default it is set to "isAlive" which means the condition will be met as long as the unit is alive while it is in the area, this can be changed to other settings such as "isDamaged" so the trigger will only activate if the player is both within the area and has damage to their vehicle. Finally check_objects comes in useful if you have specified multiple units to check, it allows you to say whether the trigger should activate if any of the units are in the area, or if all of the specified units must be in the area for the trigger to carry out its actions. This also works if a squad has been set as the object instead of an individual unit, it let you choose whether a single unit from the squad or the entire squad is required to be in the area. Next click the "Action" button and from the list select "unitMoveTo" and insert it into your trigger. This action can be used to do various things relating to unit movement (such as telling AI to move to a certain place in a certain way), but we will use it for its ability to teleport units, in this case the player. Once inserted set the object to the player's unit and target to "Destination_Area", then click the "+ move_type" button to add the move_type field to the trigger and set the field to "teleport". There are a lot of other fields here which will be useful for when you make more advanced missions, but they are outside the scope of this basic guide. Our trigger is now complete; every 0.1 seconds (10 times a second) it will check if the player's unit is within the "Teleport_Area" area and if it is it will teleport the player to the "Destination_Area" area, if the player is not in the teleport area it won't do anything. Now finish off the mission (give it a name, assign the player unit as the player, set the map to the correct map, that sort of stuff) and test it out in game. For each item in the table click [Expand] for more details on implementation and available settings. Available in SP or MP? For each item in the table click [Expand] for more details on implementation and available settings. Note: This section lists the intended functionality (where known) for each condition, some (a minority) may be legacy features, or just broken, and may not work properly if at all. "SP only", "MP only", "Both" and "Unknown" show whether the trigger component only works in Single-player missions, only works in Multi-player missions, works in both types of missions, or that the component is currently non-function / not enough is known about it to say. is: Can either be "equal" or "notEqual", if "equal" then trigger carries out actions when the current game-mode matches the one set in the "difficulty" field, if "notEqual" trigger will carry out actions when the game-mode does not match the one set in the "difficulty" field. is: Can either be "equal", "notEqual", "less", or "more", if "equal" then trigger carries out actions when the current control-mode matches the one set in the "controlMode" field, if "notEqual" trigger will carry out actions when the game-mode does not match the one set in the "controlMode" field. Functionality of "less" and "more" not confirmed but may allow for checking if the user's control scheme is set to less or more realist than the chosen value. func: Can be "less", "more", "equal", "notEqual" "notLess", "noteMore", determines how to compare the number of infantry killed to the number specified. value: the number to compare the number of infantry killed by the player to. status: Can be "completed", "failed", "notCompleted", "notFailed", "inProgress", "notInProgress", spcifies the value to compre the trigger's status to. It may be possible to make this trigger work in single player, but requires certain mission settings to be set. When a (single player) mission is marked as successfully completed the player has the option to return to the hangar or continue playng, this condition will activate the trigger once a specified amount of time has passed from the completion of the mission, if the player chooses to continue playing. use_variable: Enables the use of a variable instead of the specified value. value: The amount of time which sold pass since the start of the mission. math: Can be "2D", "3D", "notNear2D" or "notNear3D", determines how distance is calculated 2D is just concerned with 2D distance (distance between two objects on if drawn on a top down map), whereas 3D takes height difference into consideration; notNear will activate trigger if players are not within the distance, instead of being within the specified distance. math: Can be "2D", "3D", "notNear2D" or "notNear3D", determines how the players position is calculated 2D is just concerned with if the player is within the 2D footp[rint of the area, regardless of hight, whereas 3D takes height into consideration; notNear will activate trigger if player is not within the area, instead of being within the specified area. This condition is best used with the "useForTriggerFiltered" option on actions to allow the trigger to act only on units which have just spawned. This condition has a list of check boxes and drop downs to let you act on the players settings such as if they are currently in cockpit mode, currently zoomed in, are using a touch screen to play, are using mouse aim, are using a joystick, etc. Some or all settings may not work and some such as "currentMissileType" are left over from previous Gaijin games on the same engine and not relevant to War Thunder. comparison_func: Can be "more" or "less", whether the trigger should activate when the player's angle is above or below the specified value in the specified axis. comparison_func: Can be "more" or "less", whether the trigger should activate when the camera angle is above or below the specified value in the specified axis. This appears to relate to how the mouse cursor is being used (mouse-aim, on-screen joystick, control of tank cross-hair etc. ), but no functionality has been established after testing. As this condition only is believed to only work in single player, this effectively lets you check what ammo type the user is using as in single player missions you assign ammo to the player, so know what slot each shell is in. buttletNo: Can be a number between 0 and 3, determines what ammo slot the player should have selected in order for the trigger. Is a 0 based numbering system, so 0 is the first ammo slot (ammo slot 1), up to 3 which is ammo slot 4.
status: What status the trigger should be, either "enabled" or "disabled"
target_marking: Only works for Multiplayer A number between 0 and 31. Checks the marking of the target unit, units are marked with a number using the unitMark action. If multiple targets are selected only targets with the correct marking are considered by the trigger, e.g. if set to 5 the trigger will only activate if the unit is within the set distance of a target with a marking of 5, even if the unit is within distance of another target with a different marking. fuelRelMin: A number accurate to two decimal places, specified the amount of remaining fuel, unit is unknown and condition may not be functioning correctly. func: Can be "less", "more", "equal", "notEqual" "notLess", "noteMore", determines how to compare the control position to the number specified. value: A number accurate to 2 d.p, determines what the control setting should be checked against (e.g. for flaps 0 might be flaps fully up, 1 might be flaps fully down and 0.5 flaps half way; these are made up and untested numbers, you will need to experiment). property: The control to check. All units assigned under the object field of this condition are counted together, including units which have had their count increased. For example if two units have been assigned and one has had its count increased to 5 then the trigger will consider the status of all 5 sub units and the other unit, for a total of 6. If the object_type is set to isAlive with the function less than 3 then the death of any four units will activate the trigger. object: The unit(s) to check, allows for multiple objects to be assigned, groups can also be assigned. object_type: The criteria the units are evaluated against e.g. "isAlive" or "damaged"
unit_type_ex: Unknown, likely more options to check the unit's status. object_marking_var: Allows and integer variable to be assigned, likely takes the value of the variable as a marking (set with the unitMark action), allowing the trigger to be activated depending on the number of units with certain marking. value: An integer value for the number of units required to meet the condition. math: Can be "2D", "3D", "notNear2D" or "notNear3D", determines how the players position is calculated 2D is just concerned with if the player is within the 2D footprint of the area, regardless of hight, whereas 3D takes height into consideration; notNear will activate trigger if player is not within the area, instead of being within the specified area. Using this trigger requires knowing the names of different parts of a unit's damage model, finding this information is up to you. property: Can be "speed", "throttle", or "heading", determines which of the unit's properties should be compared to the value. check_filter: Can be "any", "all", "notAll", "notAny", functionality unknown. Each unit in the game has various tags assigned to it which describe it, such as what unit type it is (fighter, bomber, tank, ship, etc.) and what country it is. Working out what the tags are for a specific unit has is a fairly easy task and is done by just thinking about the unit, e.g. a spitfire will probably have the "type_fighter" and "country_britain" tags. tags: Clicking this will give you the option to add in various check boxes to check the units tag against, if the unit's tags align with those selected then the trigger will activate. For example adding and unchecking the "type_bomber" tag will activate the trigger if the specified unit is not a bomber; likewise if only the "type_medium_tank" and "country_ussr" boxes are added and ticked then the trigger will only activate if the specified unit is a Russian medium tank. comparison_func: Can be "equal" or "notEqual" determines whether the variable should equal the value or not equal the value. comparison_func: Can be "less", "more", "equal", "notEqual", "notLess", "notMore", determines how the variable should compare the the value in order to activate the trigger. checkUp: If checked trigger will be activated when player releases the specified control, if checked trigger will be activated when player presses control. It is unclear whether this option currently functions correctly. gamepadControls: Exact functionality unknown, presumably relates to use of a gamepad instead of mouse and keyboard. This appears to work like "unitsInLineOfSight", only requiring LOS between the player and the target unit, the player does not need to be looking at the unit. func: Can be "less", "more", "equal", "notEqual", "notLess", "notMore", determines how the axis value should compare the the value in order to activate the trigger. joyAngle: Exact functionality unknown, presumably relates to angle of the player's joystick (for players using one). func: Can be "less", "more", "equal", "notEqual", "notLess", "notMore", determines how the number of destroyed objects should compare the the value in order to activate the trigger. check_areas: Can be "any" or "all", decides if all specified areas must meet match number of targets destroyed or just one. math: Can be "2D", "3D", "notNear2D" or "notNear3D", determines how the area's position is calculated 2D is just concerned with if the area is within the 2D footprint of the other area, regardless of hight, whereas 3D takes height into consideration; notNear will activate trigger if the area is not within the area, instead of being within the specified area.